Two weeks ago, Side by Side held a movie night at Bowtie Cinemas for youth and families. We had the entire theater to ourselves to view “Love, Simon,” a new film that depicts the complex experience of being LGBTQ in high school. This is one of the first major movies that not only promotes LGBTQ identities, but focuses on a gay youth’s coming out journey. 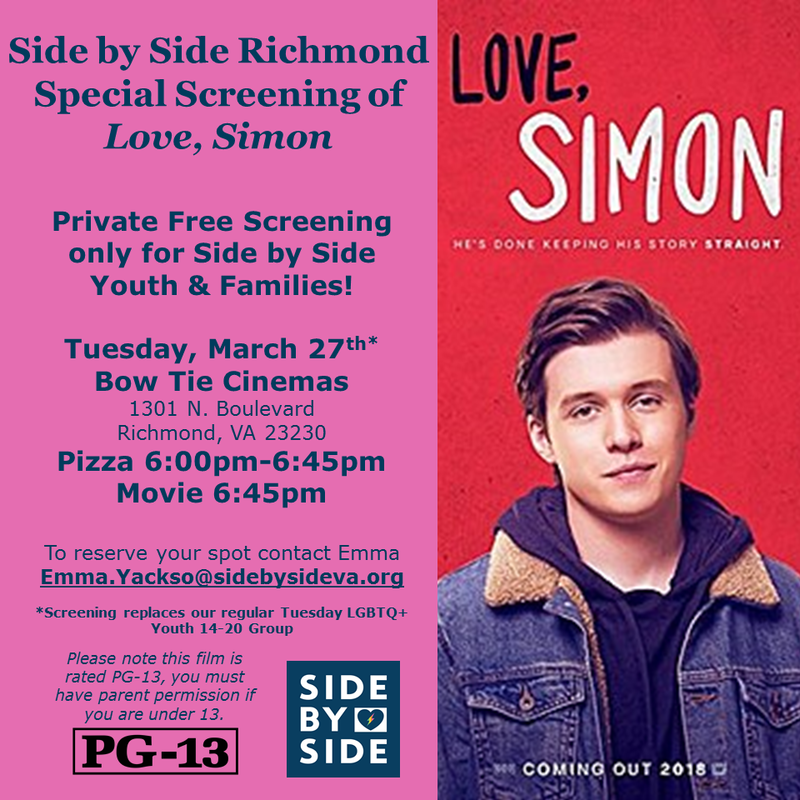 Youth were able to laugh and cry along with Simon’s journey through navigating social media, coming out, being outed, friendships and a first high school relationship. By having the theater to themselves, youth were free from any pressures or concern about other movie goers’ intolerance, and could relate and enjoy the movie as a community. In the week after the film, youth shared how much they loved getting to have a space just for them, and knowing that everyone else in the room could similarly relate to what they saw on screen. They also truly enjoyed finally getting to see LGBTQ folks represented on screen, and getting to share that experience with other Side by Side youth and facilitators. We look forward to hosting similar events in the future, and finding more ways for youth to build community and safe spaces outside of the Side by Side building.